Having come to a time of decision, you want to make the right one. You know that what you decide will carry on and you are concerned and even fearful of the “what ifs.” The only way you can truly make decisions that will best serve you now and in your future is to come to a place of peace and calm within. And this means being in harmony with your Higher Self. It is from this place that you will make decisions that are for the highest good of all concerned. When you bring fear into your decision-making process, it limits you by preventing the full expansiveness of the Divine Mind from working within your conscious mind. It is this merging with God which enables you to feel free, whole and open enough to receive that which is right and true for your life at this time. No matter how difficult it seems, it is very important that you learn to release the fear that constricts your thinking and actions. Where your attention goes, energy flows. When you focus on the fears, problems and the “what ifs” of your future life, this focused energy magnifies your fearful state. It becomes ever more powerful and can even take over your world — if you allow it to do so. Instead, put your energy into the creation of that wondrous state of being that will best serve you. The first step in doing this is to breathe deeply and know in your heart that you are being divinely guided at this moment and at every moment in your life. Prayer is also helpful in adjusting your attitude and opening yourself to truth. You can say, “I surrender this fear to God, and I allow the Divine Mind to work in all my decisions.” Even if you still have the feeling of fear in the pit of your stomach, the simple act of praying for release will start you on the path to right action and thoughts that will open you to your highest good. Yet often it takes a short while for the physical body to catch up with the mental processes, so it is important to give yourself sufficient time to come to a point of relaxation and expansion before actually making your decisions. Take several relaxing, balanced breaths. As you sit in this peaceful moment, allow your exhaled breath to drop heavily like a stone, down below your feet, into the depths of the earth. This will take the frantic energy from your mind and give you greater clarity. As you inhale, see yourself expanding with the pure light of God. See it clearing your mind and calming your heart as you connect with your divine nature. Now replace the fearful thoughts that so pervade your worldly consciousness with images of what you really want in your personal and professional life — images of radiant health, harmony in relationships, abundant cash flow, peace within your own heart. 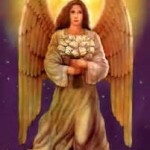 Allow these images of your greater good to permeate your being. Then give thanks for receiving them into your life. Because you have been trained to be fearful and to worry, even though it is not productive, it takes practice to release the fear and to merge with your true divine nature. 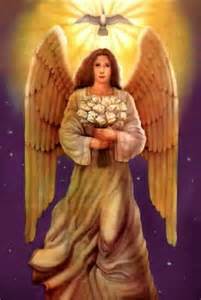 The Angels are here to help you do this, enfolding you in wings of pure light and guiding your way to peaceful living. for the ecstasy of full merging with the Divine.